The new crop of iPad Pros is expected to flaunt much thinner bezels and do away with the 3.5mm headphone jack, but they may have another interesting surprise in store for us – a redesigned and repositioned Smart Connector. If you're wondering where the Smart Connector is on current iPad models, it is positioned on the left side (when the device is held in portrait orientation), and looks like three dots. 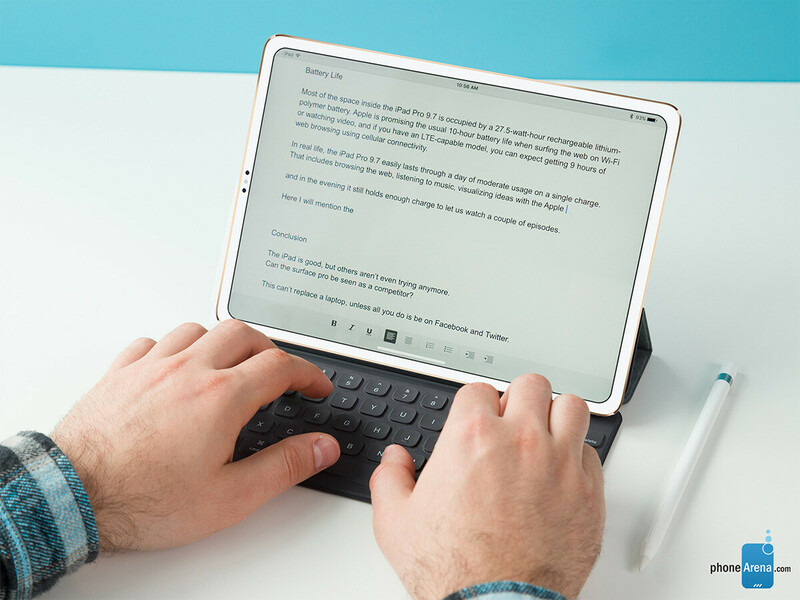 With the 2018 iPad Pro models, however, the connector is expected to change both its location and design, which could allow for some interesting new things, such as docking the iPad vertically into a Smart Keyboard. An iPad with Face ID, no physical home button, and slim bezels, has been rumored for quite some time now. Several changes introduced in iOS 12 for iPads, including a host of gestures ripped straight from the iPhone X, seem to corroborate the many reports claiming that a bezel-less iPad with gesture-based interface is coming. Furthermore, even more recently, a developer shared proof that upcoming iPad Pro models will support Face ID, which has even opened the floodgates for speculation about a "notched" iPad. New iPads getting Face ID is great and all, but when it is the only way to unlock the device, it poses a rather significant problem in regular use. Unlike smartphones, tablets are very commonly used in landscape mode, especially with a keyboard. And the problem with Face ID is that it doesn't work when the cameras are turned to the side. There were rumors earlier this year that iOS 12 may introduce Face ID support in landscape mode, but subsequent reports decisively suggested otherwise. It was initially thought that the TrueDepth camera could be enabled to do 3D face scans with the iPhone X in landscape orientation through a software update, but it seems like there may be hardware limitations preventing this from happening. Due to the way the various sensors and cameras are placed in the iPhone X, specifically the dot projector, the device can recognize your face only when holding it in portrait mode (which is the most common way to hold a phone anyway). Part of the problem is that the dot matrix is a unique pattern that's bound to the iPhone’s hardware key, and when you hold the phone any other orientation, the pattern is projected onto your face in a completely different way, preventing Face ID from recognizing you. Now, there may be ways to make it work through an update, but all evidence suggests that this isn't happening in iOS 12. Furthermore, new information has surfaced that offers a glimpse at how Apple intends to tackle the problem on the new iPad Pros. 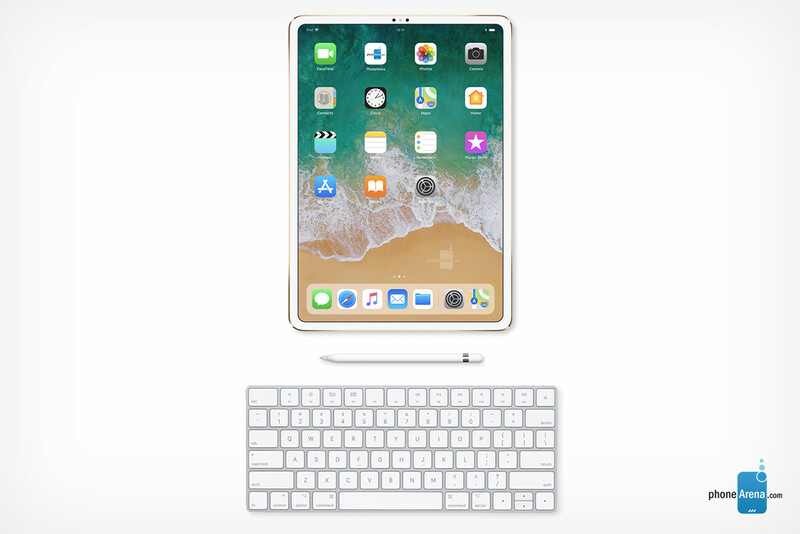 A recent report from Macotakara suggests that new iPad models will have a redesigned and relocated Smart Connector that would allow them to connect to Apple's Smart Keyboard in "new ways." The new Smart Connector will allegedly move from its current position on the iPad's left side, to “the lower rear side – close to the Lightning connector.” What's more, it will look quite different from its current three-dot design, and instead take the form of an oval indentation on the device's back. The report goes on to explain that "the next iPad Pro Smart Keyboard may be changed to vertical position specifications." Although we can't say for sure what that means exactly, it is likely implying that the new iPad Pros will be able to vertically dock into the Smart Keyboard. Although, as @OnLeaks himself says, the accuracy of this CAD can't be confirmed, it's worthy of discussion, as it is very similar to another image included in Macotakara's report. That's two independent sources confirming the same detail. The new Smart Connector, as depicted in the CAD model, looks like a lozenge-shaped indentation on the lower back of the iPad, near the Lightning port. If the image is accurate, it looks almost as though an accessory could magnetically latch onto it. The new design is quite different from the current, three-dot one, which can't be a coincidence, though we don't know the exact reasons behind this decision. 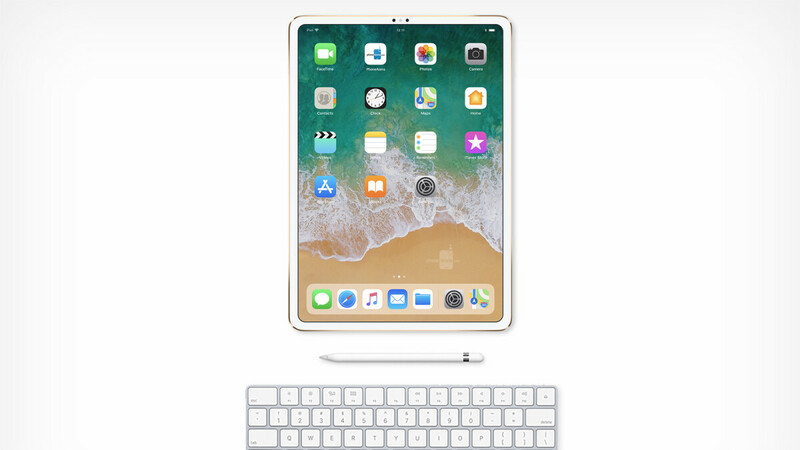 Being able to dock the iPad both into a keyboard in both landscape and portrait orientations seems like an interesting premise, and one that would partially solve the Face ID problem. However, those people who'd still rather use the device in landscape mode may have to use alternative ways of unlocking it. It's too early to say whether Apple has devised another way to help in this regard. But with all that said, actually using an iPad with a keyboard in portrait mode would be an interesting experience. It would be great for web browsing and quite alright for text editing and, well, most things you could do on it anyway. We're certainly looking forward to seeing how that pans out later this year. It's kind of funny to read to all the silly limitations that FaceID poses to users. To me it's pretty clear that FaceID is a lot inferior to fingerprint scanning in terms of both convenience and security and that the future belongs to inbuilt fingerprint scanners under the display. Apple is on the wrong path here and the reason why they can afford such a mistake is that their immense popularity will shield them from retaliation from the customers and journalists alike. Same story with antennagate, bendgate and overwhelming positive reception for the Apple Watch that in many ways is the worst smartwatch. Apple simply doesn't have to pay the price for wrong decisions. Man this statement is soooooo true. It may eventually receive a little hate mail, but it won't change the fact that these are some of the truest words ever written concerning Apple and the power of having followers. ...For marketing reasons and again only because Apple is the golden standard to which everyone has to orientate. Not necessarily because face recognition has any proven advantages against fingerprint recognition. Yea but at least Samsung and Co. will include both rather than just shoehorning the newest one in when it isn't ready and fully fleshed out. The transition will be smoother on the Android side because they'll add facial recognition and switch the fingerprint reader to the screen at some point. Apple did away with FPS, made you use your face, and will all of a sudden have it under the screen after a while. Very discontinuous. I don't like face id but I think that is the the future: a biometric based system that works with AI to unlock the device just moments before the user interacts with it; we just have to teach AI what we do just before we reach for the devices. People like you said the same thing about Touch ID when it debuted on iPhone 5s - look at EVERY device today. Just because you’re not ready for advancement - doesn’t mean the manufacturers should not advance. I switched to X from Long line of note series - specifically for Face ID. It’s got better angles than iris scanner and overall faster (that second does matter every single time you unlock your device). My hands are either too sweaty or dirty for FP and during work outs bring ability to unlock with FP sensor down to about 50% - this doesn’t happen for Face ID - dirty, sweaty, hot, cold, glasses, hat, works every time and works fast. And I look just like my dad - he cannot unlock my phone x and I cannot his (also x). I even have awareness detection turned off. And I’m still looking for someone to unlock my device. Love the new Face ID - every phone should have it. Also love 3D Touch features on iOS - every phone should have that. Just so I’m fair: I couldn’t care less for dual camera 2x zoom - pretty much a gimmick unless lighting is optimal. And I miss the s-pen on note. @bucky - That's the beauty of the web, people just rage about everything no matter what. It used to be folks would wait for something to be true, then rage about it. Now we have, rage before, rage during and rage after. It's a beautiful setup for the current web of ad supporting business. And all those sites with comment sections love it because they can capitalize on the same news/fake news more than once. If only there was a way to punish those who spread and capitalize on those things. I know that would make the web less interesting because most of the stuff on the web nothing but that. This article's intent is to invoke that rage seeing as it's all speculative. It's all in the software; if the same device has its OS built for landscape usage, that is going to be the perfect setup, but if it is having it built for portrait mode, that is going to be the perfect setup. The device is the same, the setup is different. Well. Find out September. Maybe just get current 10.5 Pro for better deal. But the x plus I’m definitely getting. just give me type c and decent file management system. then i will not buy a laptop ever. Hhmmmm, I'm wonderin if they'll change the aspect ratio from the current 4:3.